I realized how much I love this job when I walked my final time out to Runway 18 to help wave off departures from the 2015 Airventure fly-in at Oshkosh. In an abundance of caution, there were more air traffic controllers scheduled to work than was necessary for today. Just in case of bad weather or a late closure, we are all prepared to work hard this very last day. As it happened, the weather this morning was perfect, so a bulk of the visitors who flew in for this year’s show had already departed prior to the 1 p.m. airshow. When presented with the opportunity to skip my last hour or two of work, a fierce pride welled up in me and an urgent hunger for “one more round” of airplanes filled my spirit. I could not stand to walk away from this, my last year of Oshkosh, without seeing just a FEW more airplanes. I simply could NOT walk off the airport grounds without one more sip at the elixir that I only find here. Slip the surly bonds of earth, indeed. My heart flew with them this afternoon. The Cessna Caravan on floats, bound for a lake landing somewhere and a new adventure. The Maule, flying back east. A Piper Cherokee, when asked, said he was bound for Uplands, CA, (CCB) an 18 hour flight, he said. A Kodiak, winging his way back home. I aver to you that the sight of a dozen airplanes off the end of the runway, all clawing for cooler air while homeward-bound, is one of my many cherished, indelible images I keep from this gift of employment. I say I am honored (but MANY people say that about their work), I say I am humbled (but often people say that right before they brag), I say I am lucky, blessed, gifted (but those words, too, are over-used). I tell you I am changed. Yes, Elphaba, for the better. I have been changed for good. I willingly ceded the microphone to those who hadn’t gotten a chance this week. I happily walked out to the runway so others could ride with the equipment. I have never risen higher than plain old controller here at this show, but I returned to my roots as “last air traffic controller” next to the runway with a purity of spirit that we rarely get to feel anymore in our job. One hour. That is all they needed us for. I am certain they could have managed without me and my other team member running another set of orange batons. I am also certain I could not have managed to walk away without one last, hour-long grin at all the families in airplanes leaving the earth. I commit to five more months (retirement beckons 12/31/15) of focused air traffic control service back at my home facility – Wichita ATCT. I will stay sharp and teach the next generation of workers and provide the best, cheeriest, most professional air traffic controlling I know how. But all that is epilogue to my career as a controller. Today – I end a chapter. The kind where a reader gently sets the book down and simply absorbs the new reality that has come into being after a story well told. Thank YOU, Oshkosh… Thank YOU. 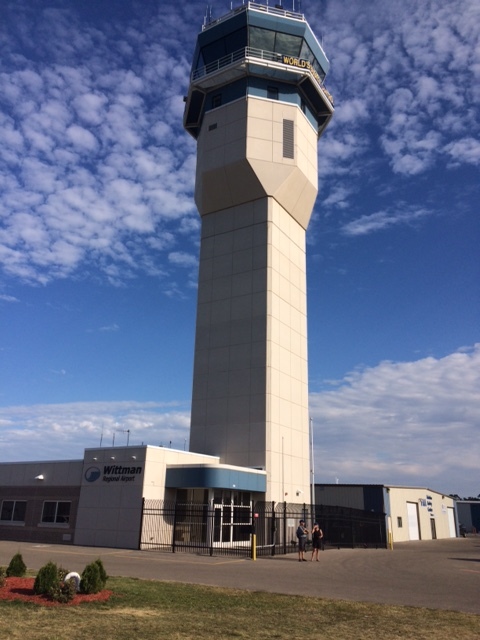 We spent the afternoon in Fond Du Lac, WI, working the temporary tower at the airport there. Occasionally, if the OSH tower has to suspend operations, pilots will fly over to FLD to park and wait for the main airport to open. There wasn’t a huge rush yesterday, so we spent a nice afternoon enjoying the weather, planes, and conversation. I noticed that EAA has an aircraft recognition link on their website – interested? Airshow this afternoon from 1430 to 1800. Best on the planet. See ya there. Just after we got wound up to work yesterday (see yesterday’s blog), we had a day off today. Rather than lie around doing nothing, we thought we’d go out and drive underneath the Fisk Arrival Procedure – you know, from the NOTAM. Picture this: thousands of airplanes (yes, in this case, I mean literally) are converging on a geographical point over Ripon, Wisconsin, in order to get in line to land at Wittman Field for OSH Airventure. I’d never been out there. I have worked FISK VFR arrival for 4 other years (those entries are in this blog somewhere, too), but had never seen the maelstrom that is the BEGINNING of the arrival procedure. What I LOVE is the faith of the pilots who fly to this point and believe that it will work for them to get to Oshkosh to land. Here’s the wording from the NOTAM: “The procedure starts at RIPON, WI (15 NM SW of Oshhkosh) and requires visual navigation. Pilots follow a railroad track from RIPON to Fisk, WI. ATC at Fisk controls traffic flow and assigns OSH landing runways and approach paths.” Sounds SO simple, but realize that each pilot has flown from their home base and are FIFTEEN miles from the END of their trip to the famous Oshkosh Airventure. The adrenaline and excitement must truly ramp up as they approach RIPON. We watched a flight of 6 biplanes follow the railroad tracks, a bonanza try to slow down to follow them, a Long-EZ stay higher by 500 feet and try to pass them all, a cherokee, several RV’s (a homebuilt airplane, not a camper), plus a flight of 5 Ercoupes all fly the tracks. It is amazing to see them look out the windows, gauge their distances, and either carry on towards Fisk and OSH, or break out and try again when they see a bigger gap. When we stopped to listen at Fisk to the air traffic controllers (our brothers in arms – cue the Dire Straits song), they were ALL focused and dialed in. ONE person talks, and at least 4 others were supporting the “communicator”. The basic operation is to send alternating airplanes to different runways. This gains space for each airplane to land per each runway and allows the tower to have some room for departures plus the other myriad arrivals to slot in with these airplanes we saw. If you are so inclined, take a listen to OSH Fisk by searching KOSH Fisk VFR arrival http://www.liveatc.net. The controlled, focused, directed instructions from ATC are just a tiny part of the brilliance and majesty of Airventure at Oshkosh. Proud to be a small part of the operation. Have a great day! Thanks for reading. Our day began at 4:45 with our alarm clocks (phones) and a drive from Neenah, where are hotel is, to Oshkosh Wittman Field. Our shift started at 6 straight up, and we would be the first controllers working this day. We raced an energetic storm front to the airport which was moving 40 miles an hour with a huge bow wave radar echo, lots of rain, and gusts of 57 mph recorded. We got to the tower just as the rain and wind got there, which made for an awesome sunrise, but a slow start to the flying for the day. Even with weather slowing arrivals and departures until almost 10 am, the pace of air traffic picked up nicely for the second half of our day. There are three crews of 4 that work the tower both in the morning and in the afternoon\evening shifts. A supervisor watches each crew, and an Operations Manager watches all of it and does the voluminous phone coordination that takes place all day. I am almost certain that the FAA got this idea from Dr. Seuss and his “hawtch-hawtcher bee watcher” story. Go read it again if you don’t remember the theme. Heck, read it to your kids, too. The link below is from www.liveatc.net, where you can tune in most of the frequencies in use at OSH for the duration of Airventure. The first 13 minutes is of my team, Team 5, working arrival aircraft into the pattern and landing for runway 27. You’ll hear 3 voices during that time. The supervisor is talking initially (fixing things we got behind on), then the Limited controller (he is the actual “communicator” and has 3 years of experience), and then my voice is on there. The nature of this kind of traffic makes it easier each of us to share the transmitting duties, rather than have one person talk the entire time and try to keep the traffic straight. It’s an odd mix of exhilarating work and exhausting work. None of us that worked that session would call that particularly busy traffic, but, all the same, we all felt fatigue after walking down the tower steps the last time today. We LOVE it. We love seeing the line of arrivals on downwind turn base and then final and all the way to landing. It is an honor to say “welcome to Oshkosh”. As we ate burgers and fries at the A & W concession stand, we enjoyed the stream of arrivals out on the runway. Root beer tastes great when you’ve done a good day’s work. This video is narrated by Harrison Ford – a long-time pilot and EAA enthusiast. It is over 17 minutes long, but by the end of the video, you may understand better what draws us all to this show every summer. 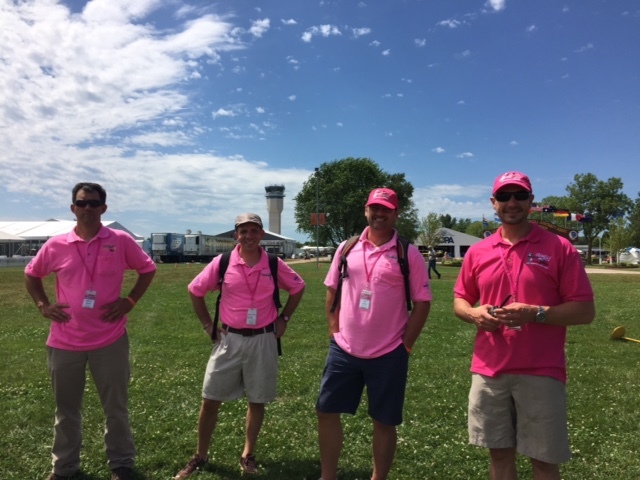 This year marks my fifth year working as a controller at Airventure Oshkosh. I am a Team Lead this year; there are 16 teams of 4 that will do the work of air traffic control during the show. Each team has a Lead, a Veteran (at least 4 years of experience), an Limited (2-3 years of experience), and a Rookie (first time to be at Oshkosh). If you scroll back through this blog, you will see my entries from my very first time here. Pilots, builders, controllers, watchers, military, veterans ALL have an affinity for this show, and we each do a tiny little part to make the whole show work. We spent the first day together in training and testing for all the procedures we will use for the next week and a half. There are roughly 75 controllers, supervisors, and managers plus 15 staff persons plus 10-15 tech ops people who come up here to represent the FAA. It is a truly humbling thing to be counted on to get all these pilots, their families, and their aircraft safely in and out of Oshkosh. Tomorrow morning we get to open the tower and welcome the first arrivals to Airventure.